At Herbal Science, quality always comes first. As herbal remedies evolve to become mainstream products, customer demand for standardization and better quality control will continue to increase. We take great care in sourcing for the right raw materials, even if it costs us more. These come from all over the world, including countries like Norway, Germany, Denmark, New Zealand, USA and Japan. When these raw materials are received, they go through a series of stringent microbial, heavy metals, FTIR, AAS and HPLC tests at Herbal Science laboratories before being passed for Production. During the Production process, quality checks (IPQC) are also performed, and the full array of tests are then repeated on the Finished Product. The finished product then undergoes a Stability test. Herbal Science has striven to uphold our mission never to compromise on product quality and customer satisfaction. In practice, this means improving on our quality assurance systems, and implementing stringent tests to identify and analyze all of the herbs that pass through our doors. Towards this end, Herbal Science has continued to invest and expand its laboratory facilities. • A room in our Laboratory, where samples of our Raw Materials are kept for analyses and testing purposes. 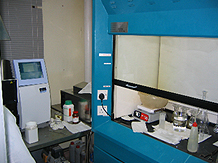 • Our Atomic Absorption Spectrophotometer (AAS) machine at work. AAS is an analytical machine used to test for trace and residual metals, for example, arsenic, cadmium and lead, in our products. 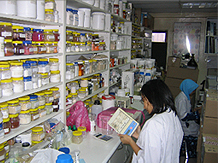 • Another view of the AAS room in Herbal Science Laboratories. 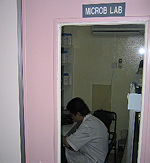 • A technician working in our Microbiology laboratory. 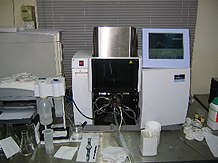 • Our Fourier Transform InfraRed (FTIR) machine. 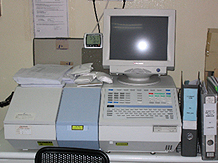 Infrared spectroscopy is an important technique in organic chemistry. It is an easy way to identify the presence of certain functional groups in a molecule. Also, one can use the unique collection of absorption bands to confirm the identity of a pure compound or to detect the presence of specific impurities. Copyright© 2012 Herbal Science Sdn. Bhd. All Rights Reserved.